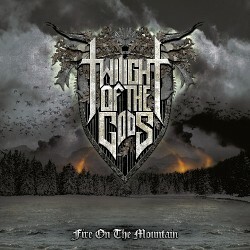 TWILIGHT OF THE GODS has arrived to claim its place in the hallowed hall of the Heavy Metal elite! The band, a legitimate super group featuring Alan Averill (PRIMORDIAL), Nick Barker (ex-CRADLE OF FILTH, ex-DIMMU BORGIR, ex-TESTAMENT, ex-EXODUS), Rune Eriksen (AURA NOIR, ex-AVA INFERI, ex-MAYHEM), Patrik Lindgren (THYRFING), and Frode Glesnes (EINHERJER) deliver one of this century’s most compelling, classic Heavy Metal albums with its debut 'Fire On the Mountain'. Truly classic metal through and through, 'Fire On the Mountain' is flush with epic galloping riffs, memorable calls-to-arms, and the tough street-ready attitude of men on a mission. Raise your horns, wield your leather and steel, and battle towards Valhalla with TWILIGHT OF THE GODS!